There are 16 reviews of Reveal Men. It seems that Calvin Klein began playing the open requisitions game like many large companies do when hiring subcontractors, skipping between IFF, Firmenich, and this time Givaudan, who was tapped for 2004's Truth for Men. At least this time we know who the Givaudan noses are, and we're back up to a three-way like in many of CK's 2000's releases. Calvin Klein has long since stopped making fragrances that can be easily categorized by traditional perfumery classes like fougère or chypre, with exceptions like 2012's oriental Encounter, but Reveal Men can best be seen as a gourmand at it's core. It feels like CK threw resumes at this fragrance rather than the perfumers themselves, as 2 of these are well-established with Tom Ford and one a wide range of niche labels, being Olivier Gillotin and Rodrigo Flores-Roux respectively. Gillotin also has consistently worked with Tom Ford and the Ed Hardy brand for Christian Audigier, while Marrypierre Julien has worked directly with Audigier's own label as well, giving Reveal Man talent from all ends of the perfume spectrum, as Flores-Roux has even worked with Avon. Additionally, CK sees itself trying to escape for a second time from the legacy of the freshie revolution it helped instigate with Eternity for Men (1989), releasing another masculine that focuses on warmth and aromatics rather than citrus and florals. The "Age of Eternity" probably ended in earnest in 2009 with CK Free, 20 years after it started, but Reveal Man proves that CK still has a lot to learn if they want to do more than make inoffensive clean masculines. Calvin Klein Reveal Men sees itself as some sort of technologically-enhanced vetiver scent, as it's typical CK in that it returns to using synthetic "Kleinisms" for accords that have fantastic names but are little more than custom captives from whatever chemist they've contracted. They gave this a break with Encounter, but are back on the habit with Reveal Men. This is a frontier they pushed before nearly anyone else, and have pushed the hardest since that E-bomb dropped on the perfume world in the late 80's, so arguably they're the best at it, despite it being abundantly clear that synthetics are not in good taste for most hobbyists; the market CK has cultivated probably can't tell the difference anymore, if they ever could, so they know their audience I suppose. I find what Reveal Men brings to the table to be enjoyable, but I agree with niche fans that the smell of science doesn't connect with the wearer on the same emotional level as recognized accords found in nature (an area where the previous Encounter could have succeeded if done better). Reveal Men opens with kiwano, which is an Asian melon, so possibly just a tweaked calone note if we're to be honest, "crystalized ginger" (okay Bill Nye leave my ginger alone), "pear brandy accord" (not going there), and the candy arabic gum-like mastic which for me is an exceptionally difficult note to use well in perfume (see 2015's Tom Ford Noir Extreme for a bad example). It's the most "Kleinism'd" opening I've yet seen, and adds a LOT of sweetness to the prominent vetiver in the base. Synth-o-suede, agave, and clary sage make for a more-conventional middle that segways quickly into the Haitian vetiver, amber, and tonka base. Woo-whee that top though!! Once you get past the Star Trek opening barrage of chemical sweetness, the scent dries into a clay-like slightly-rubbery vetiver scent, that's good for somebody who likes the smoke of vetiver but seeks to separate that element from it's greener and grassy side. The somewhat carmelized transition from fruity to smoky follows a path that does greatly remind me of a cashmere note, which seems rather more attuned to a feminine than a masculine, but that unmistakeable amber/tonka/vetiver trifecta becomes the core experience afterall anyway, with only a few wisps of the top returning to the nose. I shouldn't like this dry down at all but after a circus top full of olfactory acrobatics, I really enjoy what's left. Reveal Man has respectable sillage and longevity for a CK scent, and although it's no Obsession for Men (1986), it will stick to skin and shirt for most of the day. I can't tell you who this was meant to impress, as it's such a mash of things. Mainstream perfume fans love it, and perfumistas hate it, so it's nothing if not divisive. Just look at reviews on Fragrantica, where more everyday Joe-types drop their two cents, and it's praised by them or their significant others. Come back to Basenotes or surf various perfume blogs, and this is painted as yet another reason why Calvin Klein is the Antichrist of perfumes. Neither side is really wrong here, especially with this bizarre piece of work. Reveal Men isn't the pure synthetic nadir of Euphoria for Men (2006), but it pushes further in the abstract direction than Euphoria did as something that tries to have too many disparate elements coexisting to cover the widest swath of potential buyers. I like and recommend it as a neat and sweet little vetiver science experiment that's more wearable the longer it sits on skin, but unless you love vetiver enough to be curious about seeing it presented as the core of a sweet synthetic gourmand, you might want to pass. For the brave souls willing to drop the $20-$30 it costs to find out, stick to evening and romantic use. Reveal Men isn't much different from mid-century masculines in the way it marries a scary open with a comfortable base, just that the scariness used to be from animalic accords, and now it's from abstract synthetics that create impressions instead of directly smelling like something. Gillotin has once again created a commercially-successful mainstream masculine that's a critical failure, this time with the help of two others. Thumbs up with severe prejudice due to the vetiver. Try before you buy! Smells like other CK fragrances with that soft, sweet synthetic opening. 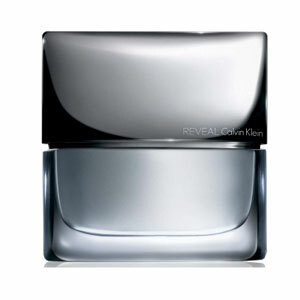 Reveal Men smells like it has something with fruity, burned sugar in it. Later, the drydown is powdery and musky. I can't tell if this leans younger or older but it does feel casual. It just very generic so it's quite versatile. Projection is just fine but longevity is actually pretty good on me. First time I smelled this, I liked it...second time I hated it(was it reformulated, or does it change color?) I got a sample sometime and fell in love with it...and missed out on a cheap gift scent of it...and regretted not getting it when I saw it. I like it because it smells almost peculiar...sugar tropical booze? i dunno. good though! Calvin Klein Reveal Men is mostly a puzzle to me, a kaleidoscope of odd notes to which I'm more or less indifferent. What an unusual collection of sweet accords: kiwano, pear brandy, agave nectar. Then mixing that with clary sage and ginger? It's simply beyond bizarre to me. The vibe is mostly a sweet green fragrance, leaning slightly to the aromatic side. It's just the type of sweetness I find just slightly off-putting to the point that I wouldn't pursue this beyond one try. If nothing else, it quickly became cheap after a 2014 release, now $20 for 100ml at Marshalls, perhaps cause for doubt but on the whole it has a good reception. Decent on projection longevity for a cheap EDT, at that. Recently picked up this bad boy discounted under $20! Great alternative to Versace Eros, which in my opinion is synthetic & gives off a fluoride mouth wash vibe from the mint aroma substitute. CK Reveal is a sweet, boozy, vanilla scent. You have the backbone of Tonka bean & Amber that gives Reveal that creamy vanilla feel throughout layered with notes of Agave, Melon, & Tequila. Admittedly, this is not the most masculine fragrance but the type that ladies tend to enjoy. I received two compliments my first time wearing Reveal. While it's not a favorite in my collection, I appreciate this unique, well blended fragrance & the artistic risks the perfumer’s took. No complaints on longevity or projection either. Nice release from the house of Calvin Klein. Thumbs up. From prior reviews, I can see that this one is polarizing. As always try on your skin before you buy. A sickening, syrupy, sticky watermelon/fruity thing with harsh chemical noise entering the background after a while, something charred. I guess that would could be the listed coffee note but to me it smells like a tar note that I guess is meant to make this masculine but I just find it unsettling in this setting. Especially when it wears out its welcome after 15 minutes but sticks around for a full 24 hours. Full marks for persistence. There are no member images of Reveal Men yet. Why not be the first?